Smother Goose: "Not Now, Bernard"
This one is charmingly creepy, if there can be such a thing. Bernard just wants a little attention from his mum and dad, but every time he tries to speak to them, they reply with a peremptory "Not now, Bernard." Then we learn what Bernard's been trying to tell them--"There's a monster in the garden and it's going to eat me." Like a latter-day Cassandra, Bernard finds his words go unheeded, so when he ventures back out to the garden, sure enough, the monster eats him. All that remains of the boy is one small shoe dangling out of the monster's mouth. 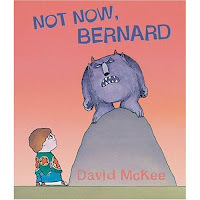 The monster goes into the house to wreak some havoc, but the parents don't ever look up from their activities, only saying "Not Now, Bernard" as the monster bites the father's leg or jumps up on the TV set. 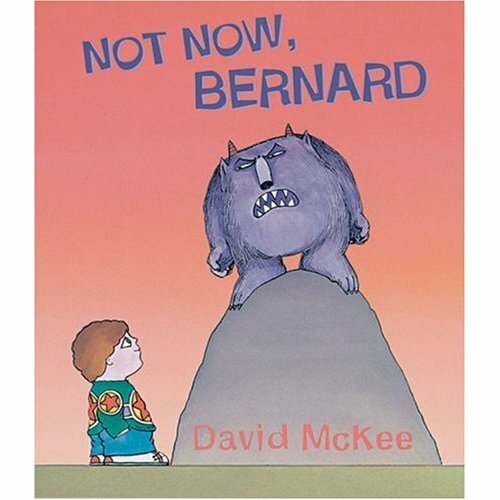 The monster is sent up to Bernard's room and told to go to sleep. "But I'm a monster," the monster weakly protests. "Not now, Bernard," the mother replies. So, it seems DJ Jazzy Jeff and the Fresh Prince were right-- parents just don't understand. One could argue that the events of the book are Bernard's Calvin-like fantasy and he is the monster, but the illustrations don't seem to support that. Bernard's grisly murder goes unavenged. If a monster kills and eats you, your parents won't ever notice. McKee, David. Not Now, Bernard. London: Andersen P, 1980.